RPF SI Recruitment 2018 notification released on 01st June 2018. From 01st To 30th June 2018 RPF Sub Inspector Recruitment Notification will be in the active state @ si.rpfonlinereg.org / indianrailways.gov.in page. Connect to this page to know the RPF Sub Inspector Online Application Form dates. Officials released the RPF SI Online Link on their sites to recruit 1120 Railway Police SI vacant setas. Indian Railway Recruitment board has officially confirmed the news on RPF Sub-Inspector Recruitment 2018. Before some days, we might be heard the RPF recruiting the 9500 posts combining in Constable & SI Posts. In the same way, now it is getting ready to release the RPF SI Recruitment 2018 notification for 1120 vacancies in between the days of 19th-25th May 2018. All the details of the future notification are provided below. Check now. 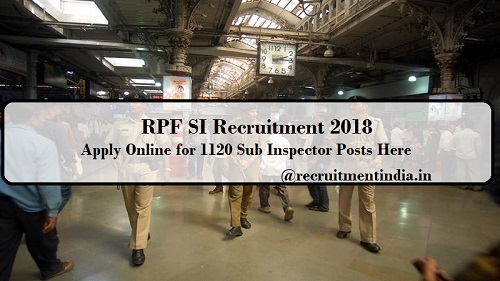 Railway Protection Force is going to release the RPF SI Recruitment 2018 of 1120 posts. The dates of the RPF SI Recruitment Online Application Released on this 01st June 2018. Get Ready to apply for these Railway Protection Force Sub Inspector Recruitment. RPF Recruitment 2018: Indian Railway system has its own security force or police force with the name of Railway Protection Force. The recruitment in this RPF section will be looked after this Railway Recruitment board. So it has only released the intimation of the Railway Protection Force SI Recruitment. In that intimation notification, it has officially confirmed the time range of the releasing Railway Sub Inspector Jobs Notification. Check Rojgar Samachar June 2018 at our page. Download the Railway Protection Force SI Notification to get the recruitment eligibility details like educational qualifications, necessary certificates to apply for these vacancies, the process of successful submission of the application form, RPF SI Salary range, when will be the links of application form will come into live etc. All these details are explained to the job seekers through the RPF SI Recruitment Notification. The undeviating link to download that notification is given below. You may get the latest Railway Jobs alerts at our page. Check the details of the RPF Sub Inspector Police Jobs to know either you are an eligible candidate for these 1120 vacancies or not. As we had said the Indian Railway Board only releases the future railway job alert by means of a notification. All should Complete Registration of this Railway Protection Force SI 2018 Recruitment will be on 30th June 2018. That advertisement intimates the starting and ending dates of the application form. RFP hiring board will accept the applications in between those two dates only. So be ready with all the details to complete the Railway Police 1120 Posts Application Form in the initial days only. Do you know the Eligibility Criteria For RPF SI Recruitment 2018? If you don’t know the criteria, check below-mentioned details. Firstly we will go the with the educational qualifications only. 12th Class passed certificate from a recognized college. Any candidate who has the 12th or Intermediate or +2 Class XII qualification may apply for these RPF SI jobs. Apart from the schooling qualification, age limit is another requirement from the RPF board. Every applicant should follow the rules of Indian Railway in terms of Age. Age Relaxation is also applicable for the OBC/SC/ST Category candidates. What are the RPF Sub Inspector Selection Rounds 2018? At present situations, more candidates are applying for the Sarkari Jobs, so the government departments also make the selection process tough by conducting two or more rounds. Now for this RPF SI Recruitment, the applicants have to undergo through various SI Selection Rounds. Below all the rounds of recruitment are given. How many numbers of Vacancies present in the Railway Police SI Recruitment? Through this RPF SI Recruitment, nearly 1120 Sub Inspector (Male & Female) Posts are recruiting. Applying postulants must look at the total number of posts released by the notification. So check below RPF SI Vacancy details. What is the exact RPF Sub Inspector Salary in Hand? Before applying for any job, candidates will have the know salary offering for those posts. So here also for these Railway Jobs, individuals what to know the salary of RPF Sub Inspector along with Grade pay. They want to know these posts salary details through the pay slip. As per the 7th Pay Commission, the salary of RPF Sub Inspector is Rs. 9300 to Rs. 34800 with Grade Pay of Rs.4200/. What is the Application Fees for RPF SI Application Submission in 2018? This payment of application will vary with the category-wise. We have updated the number of fees for all categories. Apply Online Railway Police 1120 SI [email protected]. To see the activated link of the application 01st June 2018. the one who joined in these Police jobs will experience a good career. These jobs come under both Central Government Jobs and Police jobs. Best Salary package will be offered to the joined candidates along with various allowances like Home, Travel, Medical Facility and many more. After knowing all these, many candidates are very curious about this RPF SI Recruitment 2018. Bookmark this genuine details giving page for application dates of the notification and RPF Sub Inspector Online Application Form link. In that page choose the Recruitment Option. In the starting only, the Full Information Brochure of RPF SI Advt will be available. Download it. Check the instructions and guidelines given in it. If you have that mentioned qualifications, fill the RFP Online Application Form before the last dates. In last date of application, the serve will be very busy so complete the form before only. Upload Passport pics, signature, Make Payment. Do the final submission of the form after verifying the entered details. Save the submitted application Form.